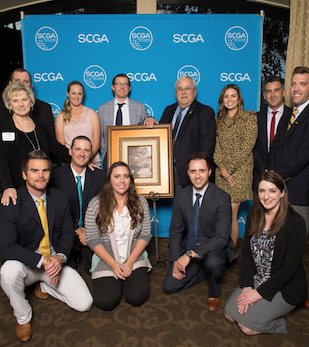 As the SCGA Hall of Fame inducted its 11th class Tuesday at Brookside GC in Pasadena in front of more than 200 guests, the theme of the day was family. Tom Addis III, former PGA of America President and current Executive Director/CEO of the SCPGA, entered the Hall of Fame surrounded by family and friends along with the first-ever father/son duo of William F. and William P. Bell, renowned golf course architects. Tom Addis’ name is synonymous with Southern California golf. A legend in the SoCal golf community, Addis is revered for his contributions of over 45 years to the game and the region. Addis, who currently serves as the CEO/Executive Director of the Southern California Section of the PGA, is a longtime golf professional who served as president of the PGA of America from 1995-1996. "You don't know how meaningful today is to me," said Addis at the ceremony. "I started in golf at 10 years old, caddying for $1 a round in Fresno. To have the opportunity to do what I've done since then means the world to me." Throughout his impressive tenure in the golf business, Addis has served on the board of directors for the San Diego Junior Golf Association, Lorena Ochoa Foundation and the California Alliance for Golf, where he’s a founding member and past president of the statewide advocacy organization.Until 2006, Addis also served as owner and president of Medallion Golf Inc., a golf facility design, construction, operations and management services company. During his career, Addis has received several special distinctions including the Joe Graffis Award (National Golf Foundation), Horton Smith Award (PGA of America), Herb GraffisAward (SCPGA), Langley Legends Award (NCPGA), Conrad Rehling Award (Special Olympics) and National PGA Golf Professional of the Year (PGA). "What it's really about is what we all mean collectively to this great game," said Addis. "All of us here in this room, all of the great people and organizations I've worked with, we love the game and we love what we do." During his current role with the Southern California PGA, Addis has committed significant resources to developing community-based initiatives that have impacted the Southland golf environment. He has worked tirelessly in support of player development programs including Golf in Schools and Neighborhood Golf. As a Conrad Rehling Award recipient, Addis has impacted the sporting world, helping establish golf as a recognized sport in the Special Olympics Games. He has ensured that everyone, including children and adults with special needs, school programs and community outreach programs, have access to the game. And Addis practiced what he preached. He raised his two kids around the game, and today both his sons are presently involved in the golf industry. His son Bryan, a PGA professional at The Crosby in Rancho Santa Fe, was on hand to induct his father into the Hall of Fame. "Both my brother and I built successful careers in golf out of the example my father set not only in business, but as a father and leader," said Bryan. "What I am today is because of him." For Addis, the induction into the SCGA Hall of Fame is especially meaningful because of the others who have been inducted before him. "Mentors and role models of mine like Len Kennett and Eddie Merrins, knowing I'll be with those two gentlemen and others well into the future, is especially special to me." Joining Addis posthumously in the 2017 Hall of Fame class were William F. Bell and William. P. Bell, who are responsible for some of Southern California's greatest golf courses. If you’ve stepped foot onto a Southland golf course, a few degrees of separation would tell you that property had a Bell family influence. The dynamic design duo had a major role in shaping Los Angeles’ golf scene. On hand to accept the honor on behalf of his family was Jim Bell, the oldest living relative of the honorees. "This is a great chance to reminisce," said Jim, who was also joined by the founder of The Bell Society, Mark Stuart. "I have fond memories of Uncle Billy and this induction means a lot to my family." William Park Bell, most commonly known as Billy Bell, Sr., and William Francis Bell, nicknamed Billy Bell Jr., were legendary golf course architects who made significant contributions to Southern California golf in the 20th century. As a young man, Billy Bell Sr. moved to California and served as caddiemaster at Annandale GC and then greenskeeper at Pasadena GC. In the 1920s, he spent his early years as a course architect collaborating with George Thomas Jr. on legendary designs such as Bel-Air CC and RivieraCC, to name just a few. During World War II, Billy Bell Sr. was a turf consultant to the U.S. Army Corps of Engineers. Billy Bell Sr. has more than fifty courses credited to his work and design, and also served as president of the American Society of Golf Course Architects in 1952. Among his most significant SoCal designs are La Jolla CC, San Diego CC and both courses at Brookside GC in Pasadena. In 1953, Billy Bell Sr. passed away, leaving behind his vision for the design of Torrey Pines GC. Billy Bell Jr., a graduate of USC, joined his father’s design business in the post-war years and created some of Southern California’s best-known tracks, including Sandpiper GC, Industry Hills GC and Bermuda Dunes CC. He also pursued his late father’s design of Torrey Pines, overseeing the creation of both the North Course and the SouthCourse in the late 1950s. Billy Bell Jr. passed away in 1984, just after contributing to the legacy of California’s First Family of Golf Course Design. Both Bells continue to be remembered as legends within the golf industry. Addis and the Bells join a Hall of Fame that includes noteworthy greats like Craig Stadler, Corey Pavin, John Cook, Amy Alcott, Charlie Sifford and Al Geiberger. Click here to view a full list of inductees. Scott Medlock is the official artist of the SCGA Hall of Fame, and honors each inductee with a personalized painting.